Have a driveway, concrete slab, sidewalk, or patio that needs demolished? Great Lakes Excavating is the one to call for all your concrete breaking. Our team of professionals has the versatility and skill to get the job done safely, quickly, and done right. We can pretty much break all types of concrete whether it is concrete at an industrial, commercial or residential property. Our concrete breaking team comes in with the right equipment to get the concrete broken up and hauled off efficiently. 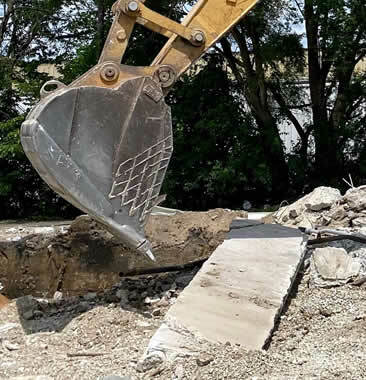 We have the knowledge and comply with local and federal safety requirements for concrete breaking services, as well as additional safety training. We can meet your needs, just contact Great Lakes Excavating today to discuss your concrete breaking needs.